Satsahasrika-hevajra-tika, a commentary on the Hevajra-tantra, a Vajrayana or Esoteric Buddhist text, is published here for the first time. It is second such commentary to be available in print. 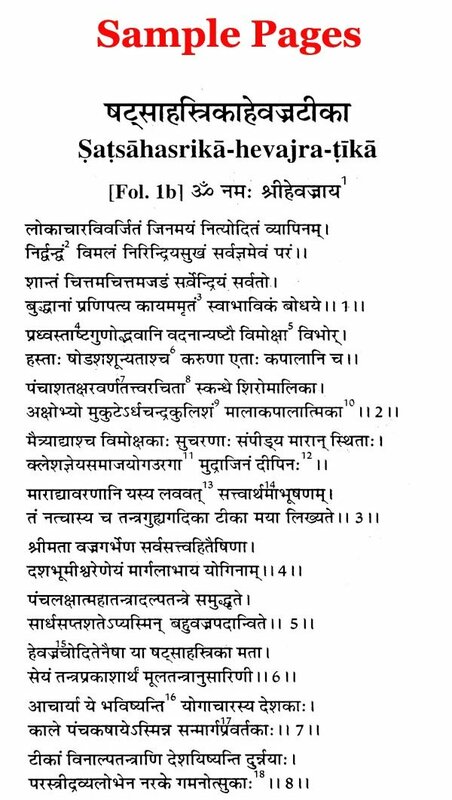 A fragment of Sanskrit text only is available, the author being Dasabhumisvara Vajragarbha. Although the Tibetan translation of the commentary available in bsTan. 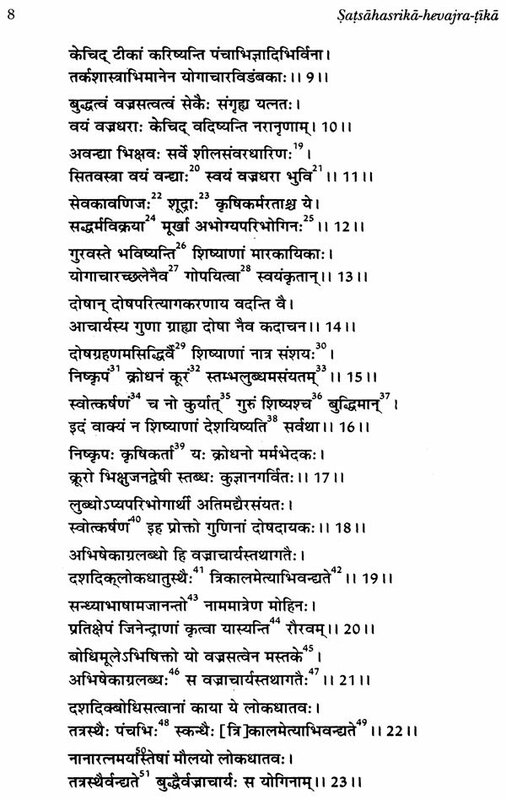 hgyur comments on the whole of Hevajratantra, the editor has doubts about the authorship of later chapters. In the course of the commentary, the author throws light on the socio-religious ethos of his days and is highly critical of many of the then current practices. Besides this, the commentary furnishes many technical details which are difficult to understand without a guru well-versed in the esoteric lore. In order to complete the picture, the summaries of the chapters from Tibetan translation are supplied by the editor. Malati J. Shendge, editor of the commentary, is a well-known Indologist, and has worked for more than two decades on Vajrayana as practised in India, Tibet and Japan. She has published several articles on different aspects of Esoteric Buddhism, and has presented a penetr4ting analysis of Esoteric Buddhism and its thought world with social anthropological methods. In order to be able to have easy access to original sources and to carry on research on this most complex system of religious thought and experience, besides modern European languages, she has mastered several other languages—Sanskrit, Pali, Tibetan, Buddhist Chinese and Japanese. I am delighted to present this critical edition of Sat-sahasrika-hevajra-tika, the first fruit of my research endeavour, to the Buddhist world. Along with it, other material relevant to the Hevajra-tantra is also included. All this work was done between 1960-63 as part of my doctoral dissertation. As many readers may recall, hardly anything was known about Vajrayana at the time. Nor is the situation any the better now. But personally I think after all these years I have developed some insights into its nature. This is due to the base prepared in those early years. Let me quote from my preface to the dissertation: "... I found that in order to conduct scientific research in this field, it is essential to observe certain principles. First, Vajrayana should be treated in its totality as one religio-philosophical system... Instead of treating various texts as independent isolated works, they should be treated as parts of a system (of thoughts) and should be interpreted in connection with other correlated texts which will lead to the understanding of its philosophical background. This is of first-rate importance in Buddhist Tantrism as it is not only a philosophy but also a religion, and certain practices severed from their philosophical background will lead (as in reality they have) to many a misunderstanding about the nature of Buddhist Tantrism as religion." Nov I would like to add that in order to appreciate the true significance of a given religion, it needs to be studied in its indigenous context and it is unjustifiable to analyse its concepts and doctrines from the standpoint of the concepts of other cultures or religions. Such a study does not lead to the understanding of the system in hand. In fact, it’s true understanding may be marred and the study may result in a mere verbal circus leading to intellectual obfuscation. The task of understanding a given culture by a practitioner of another is itself a daunting one, and in fact some social anthropologists like Henry Frankfort have thought it pratically impossible. I have independently come to the conclusion that understanding of an alien culture is indeed difficult, and more so that of Indian culture by a foreigner as it was born and developed over five millennia, and carries within its fold innumerable survivals of earlier ages. This is not to say that I have succeeded in bringing the Vajrayanic teaching any way within the grasp of the present day reader—far from it. Only point I can add after all these years that systems like Vajrayana are not for mere intellectual discussions carried on in contexts of philosophy, philology, collation of manuscripts, critical editions and dissertations. The awakened ones i.e. those apparajakkha-jatikas, as Pali Buddhism calls them, must really search for an experienced guru and then drink deep at that fountain of knowledge only to experience all that. No amount of wordy knowledge is complete without that experience and once set on the path the traveller never looks back. Buddhism is world's first rational religion, thought out logically by a human being who existed historically. In this event man's religious thinking rooted in reason, in other words, reason itself, came of age. This is a very unique circumstance as far as a religion is concerned. Even though several centuries of thought development intervened between the Buddha and the onset of Vajrayana, still there is an underlying thought and conceptual continuity which must be noted. 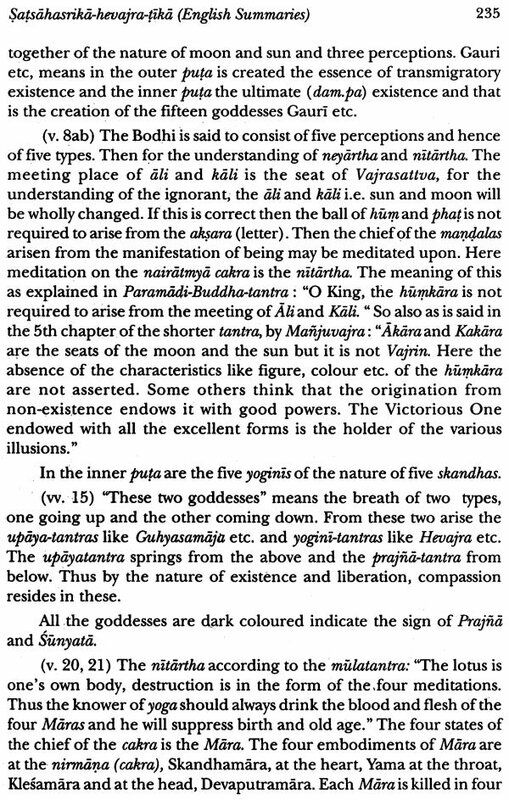 What appear to be the changes, are attempts to spell out the psychic experiences and also they endeavour to bring Buddhism closer to the aspirants through use of new yogic techniques which may not have been known earlier or also could have been rejected by the Buddha because of his preoccupation with self dependence. In fact the Buddha's preachings do not describe the psychic experiences. He discouraged his disciples from indulging in philosophical speculations and also descriptions of experiences barring a few landmarks. But later on this aspect came to be developed in detail. Vajrayana has to be looked at as such a development. All that looks obscure in Vajrayana are generally the inner experiences of the practicants expressed in words. Unless one undergoes them, it is practically impossible to recognise or understand them. In the initial stages of my study of Tibetan language, I appealed to His Holiness the Dalai Lama who had just arrived in India (1959), for advice and assistance. I owe a deep debt of gratitude to His Holiness for prompt reply and arrangement for my study in Mussorie. Mrs Mary Tering gave me lessons to begin with. I remember her with affection and gratitude. I must also express my sincerest gratitude to Late Professor R.D. Vadekar for all manner of assistance, encouragement and unsparingly bestowed care, affection, and guidance in the interest of enhancement of knowledge. I am deeply grateful to Late Professor Dr. V.V. Gokhale who is sadly enough no more with us to see the work done under his guidance in print. I cannot help reminiscing in the manner of his guidance. After reading the manuscript of Hevajratika the problem of tracing the quotations arose. I expected his expert help and advice. However, he left all that to me and I must confess that I was baffled but was compelled to find my own way. Ultimately I succeeded in tracing all the quotations from multifarious and more often than not unheard of texts. This I considered more of a miracle than an intelligence oriented pursuit. But Dr. Gokhale's greatest gift to me has been the opening of a critical eye which has stood me in good stead through these years. Thanks are due to K.P. Jayaswal Research Institute, Patna for lending the use of the photographic negative of the manuscript of Satsahasrika-hevajra-tika through the University of Bombay and also to the Bihar and Orissa Research Society which gave me access to their collection of Tibetan Manuscripts. Thanks are also due to the Department of Buddhist studies, University of Delhi for making available to me a microfilm of another manuscript of the said tika and of Srisahajasiddhi from the Bir library, Kathmandu with the generous permission of the Nepal government and the Indian Aid Mission (Nepal) and also its copy from the collection of Oriental Institute, Baroda. I must also mention the facilities extended to me for the collation of the Tibetan Text (sDe.rge edn) available in the collection of Benares Hindu University, Varanasi. Finally this work was possible at that time because of the financial support by way of a fellowship extended to me by the Department of Buddhist Studies, University of Delhi. Amongst those who rendered multifarious assistance and to whom I would like to express my sincere thanks, I mention Mr. Ryojun Sato, Lama Chimpa, Mrs. Yang and Mr. Raghavendrachar. 1. 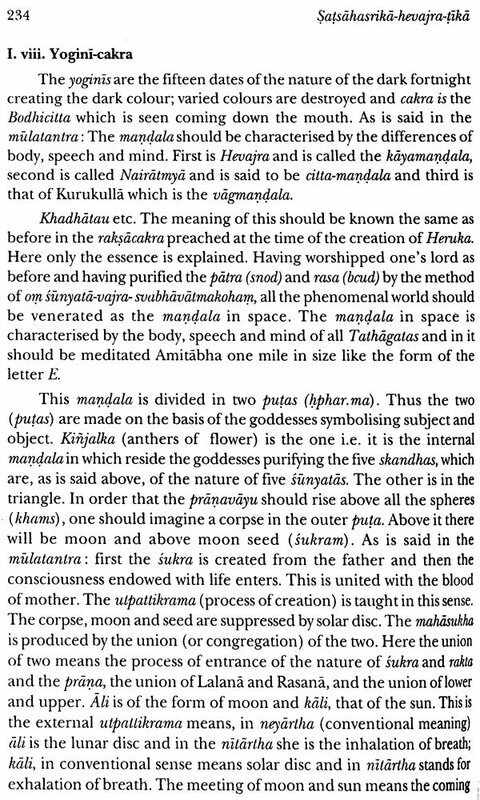 Description of the mss: In the preparation of the critical edition of Hevajra-tika two manuscripts were utilised. 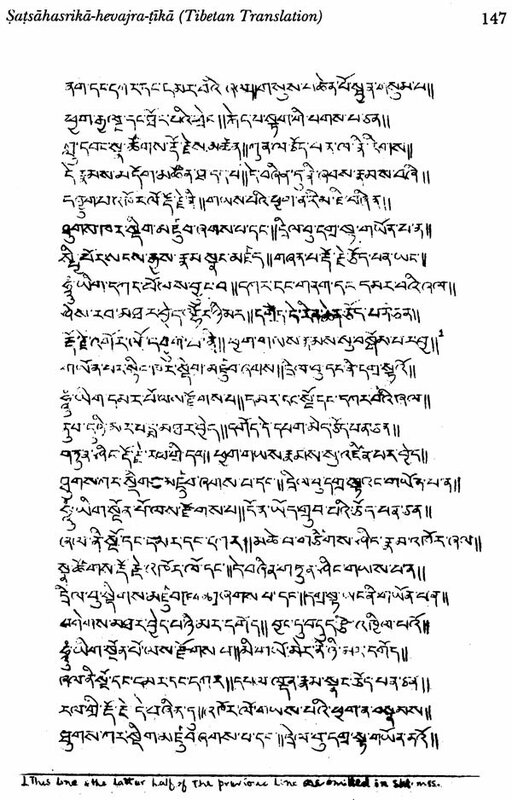 One is a photostat copy of the manuscript discovered in Nor monastery, Tibet, by R. Sankrt-yayana (RS). The other is the microfilm of the manuscript preserved in the Bir Library, Nepal. Both the mss are incomplete. The present photostat copy of the Nor ms. belongs to the collection of K.P. Jayaswal Research Institute, Patna. It was photographed by RS in Tibet and is mentioned in his "List of the palm leaf Ms. from Tibet".' The ms. is written on palm leaf and is in good condition. It is pinned on a wooden board and many letters are lost under the pins. There are in all six big plates of the size of 12 x 9.5 each containing ten folios i.e. in all there are thirty folios and sixty pages available. The heading on each page is Daasahasrika-hevajra-tika- written in devanagari, (obviously by the photographer) accompanied by plate-number. On the first folio of the ms. the title of the text is written in Tibetan dbu.med script as: (hevajra-tika-Vajragarbhasya). Above the title is written Vajragarbha (in devanagari) who proves to be, in the course of the text, the author of the OWL The manuscript is written in on handwriting throughout and is fairly legible. Wherever the scribe has made mistakes he has put two dots on the top of the letter to indicate cancellation. There are a few scribal errors or slips of the pen. The manuscript must have been used very carefully as none of the pages are in any way damaged and there are no marginal notes, etc. 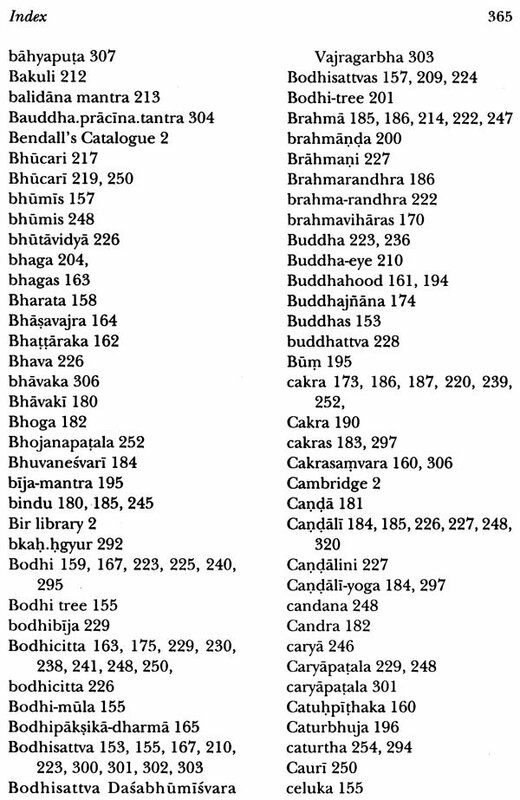 But the last page of the ms. contains an account of the grains donated to a monastery called Sri Raudharmamahavihara in the Saimvatsara 210 i.e. circa 1098. Paleographic Data of the mss : Numerals : The method of pagination is a mixture of ancient and modern style i.e. the figure numerals are similar to those given in Buhler's pl. 9 Nepal MS. no. 866 but the tens are indicated by adding a zero which suggests a later date, i.e. later than 8th century. But from the evidence furnished by Bendall's Catalogue of Sanskrit Buddhist manuscripts in the Cambridge University library2 it is clear that this manuscript belongs to the early part of 11th century or a little earlier than that, as the numerals of the ms. no. 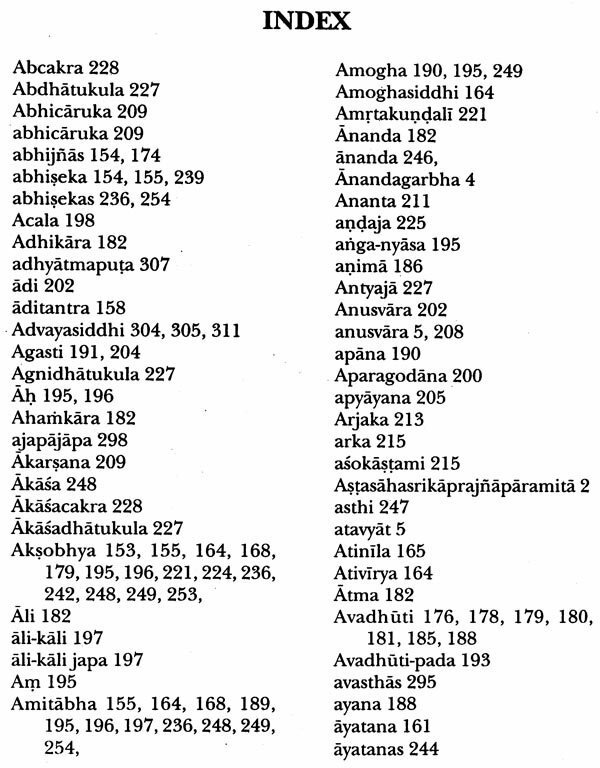 866 Astasahasrikaprajnaparamita agree with this except in the zero written below the figures indicating 10, 20, 30. The script is hooked Newari and many letters are similar to those given in Ojha's chart "no. 24 —nepal se mile hue hastalikhita pustaka men (10th century A.D.) ". Bir library ms. of which a microfilm was used bears the no. c 93 (M.L. 250) on the title page. It is a palm leaf manuscript broken in many places; but fortunately no letters are lost. Many times the letters are faint and blurred. This ms. is also a fragment and contains 28 folios, followed by a folio numbered 29, followed by another fol. 29 but the contents of this fol. 29 are not a continuation of the previous page and a big gap becomes obvious from the Nor ms. Thereupon follows a folio numbered 44, the last two lines of which are inconsistent and added from the later part of the text. The numerals indicate that the ms. belongs to the latter half of 14th c. A.D. The script is devanagari. Both the mss. are incomplete. But Nor MS. is the longer. A third manuscript, I am told, is available in the library of Field Marshal Samsher Jung, but it is also fragmentary. 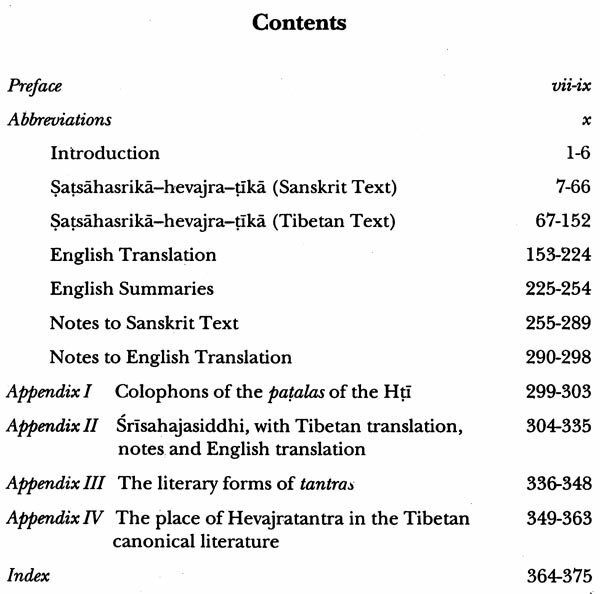 The extent of the Tibetan translation available in Peking edition of Tibetan Tripitaka4 is 130 folios and a comparison of the Sanskrit text of the Nor MS. shows that the fragmentary Sanskrit text is only a fifth part of the whole commentary. I have used the Peking edition of the Tibetan Tripitaka, collating it with the sDe.rge edition (Benares Hindu University Collection) which was found to be deficient in Folios 3 and 12-24. 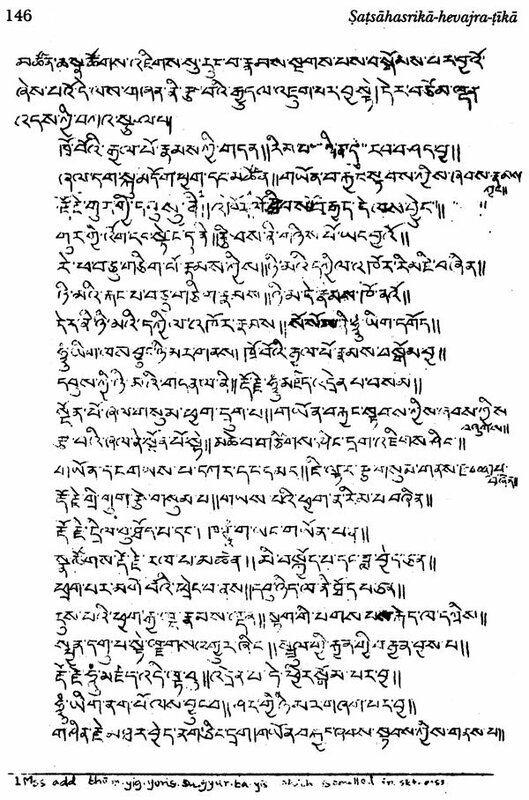 The emendations suggested in the text are in general based on the Tibetan translation, unless otherwise mentioned. All the variant readings are noted in the footnotes. The additions to the ms. in cases where the readings of the MSS. are found defective are based on the Tibetan translations and marked by square brackets. The verses are numbered in order to facilitate references. No such arrangement is followed in the MSS.